Trouble has been brewing in the Sea of Azov all year. It started with Ukraine’s seizing a Russian fishing boat and detaining its crew in March. The Ukrainian President Petro Poroshenko canceled the Friendship Treaty with Russia. After that he has accepted surplus US naval vessels to prop up a navy that exists in name only. This is all in response to Russia’s completing the Kerch Strait bridge which Russia can use to block access to the Sea of Azov. The Kerch strait is Russian territory and, by international law, Russia can limit access to the Sea of Azov. So, this weekend’s incident in which a tug was rammed, ships fired upon and seized by Russia, ultimately was a proper and legal response to a clear provocation because the Ukrainian military ships refused to announce their intentions. Let’s not beat around the bush here. This incident is meant to justify further antagonism between the West and Russia on the eve of the G-20 and the planned meeting between Presidents Trump and Putin. It also was meant to enflame Ukrainian nationalism and drum up support for Poroshenko who is trailing badly in the polls as we approach March elections. Declaring martial law so as to potentially suspend those election, the US satrap is raising the stakes on Russia to it finally responding to these repeated provocations. At the same time the Ukrainian Army unleashed the heaviest shelling of the Donbass contact line near Gorlovka in years. There are a number of different angles on this incident and how it will be used to increase tensions between the West and Russia. 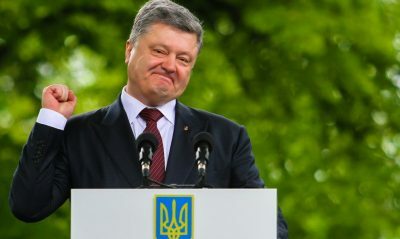 Russia is officially taking the position that Poroshenko is doing this to keep his Western backers happy who have dumped billions into him and his government to keep Ukraine a festering wound on Russia’s border. It is also a desperate attempt to prop up this failing government and potentially suspend March’s elections. While I am certainly sympathetic to that position, it is also the least interesting part of it because it is so blatantly obvious. I think the deeper gambit here has to do with Poroshenko ending the Friendship Treaty. According to Rostislav Ishchenko ending the treaty works only in Russia’s favor as it removes the permanence of the boundary between Russia and Ukraine. In effect, it opens up the path to Russia to recognize the breakaway republics of Lugansk and Donetsk. But, it’s more than that because it also opens up the argument that the Sea of Azov is now International Waters since the border is in dispute. This allows for legal maneuvering by Europe and the US through the UN to find Russia in violation of Ukrainian vessels’ right of passage. I’m not saying this is the case, being no legal scholar on this, but this looks the most likely tack to take to sell the world further on the evil, expansionist Russia narrative. And that argument can hold weight because no one recognizes Crimea as part of Russia, officially. The UN Security Council’s usual suspects – Europe and the US – backing Ukraine on this issue was wholly predictable. And the question now will be whether the US got its casus belli to try and force NATO ships into the Sea of Azov under the pretext of keeping the peace in International Waters. Former British MP George Galloway, writing for RT, suspects this may simply be a ‘Wag the Dog’ moment for not only May but French Poodle Emmanuel Macron and Trump with his Mueller ‘troubles.’ Invoking Tennyson’s Charge of the Light Brigade Galloway muses. A dangerous constellation of weak, collapsing Western governments and leaders suddenly find their interests coinciding with the tin-pot tyrant Poroshenko. And into the Valley of Death they might just be ready to send their people charging. If they do they will find a resolute Russia far stronger than at Balaclava. I would go even further at least as it regards Theresa May. This provocation occurred in concert the announcement of British forces being sent to Ukraine next year. With the May government betraying the British people over Brexit with her awful deal, continuing the distraction of evil Russia is one way to keep support from failing further. Because, deal or no deal, May is finished once we’re past this and like her accomplishing her mission to betray Brexit, setting NATO on a collision course with Russia is more possible by having British forces on the ground. All manner of false flags can be ginned up to saddle any incoming Labour government with. Going back to the transition period between the outgoing Barack Obama and the incoming Trump everything imaginable was done to poison Trump’s early days as President. The idea that Trump and Putin could establish normal relations was anathema. He’s been bogged down ever since. And who was behind that? British and American Intelligence along with the judiciary who today are slowly being pulled into the limelight of their corruption. This is all part of a carefully stage-managed plan. Those who cling to power do so out of desperation and will use every trick and point of leverage they have to remain where they are. In that respect Poroshenko is no different than anyone else. He knows if he loses power he will be expendable, to be thrown to the wolves while the US and Europe move to back the next quisling presiding over Kiev. There doesn’t seem to be much on hope on the horizon regardless of the elections. The big question at this point is whether Ukraine as a neocon project to destroy Russia is still worth the trouble. That’s what Poroshenko and those behind him hope is the case. I’m not convinced they have enough support to keep this up, given the tepid response from Europe. If no sanctions are added to Russia over this incident and NATO is not dispatched to ‘calm things down’ in the Sea of Azov then this was nothing more than an attempt by Poroshenko to derail elections and rally Ukrainian nationals. The Verkovna Rada cut his martial law demand down to 3o days from 60 to ensure elections happen on time. But looking ahead to the G-20, Trump will be saddled with this incident precluding finding any common ground with Putin over anything important. The two need to work out a plan for Syria, Korea, Japan and Iran and now we’re talking about Ukraine. So, the days pass and nothing of substance changes. Putin knows time is on his side while those arrayed against Russia become increasingly desperate to justify its destruction to a tired and skeptical world.